Homekill is the slaughtering and butchering of your own animal either by your self or a homekill service provider. A licenced Homekill and Recreational Catch Service Provider Hannah Homekill will slaughter your animal for you cleanly and stress free on your premises then provide you with a finished product that has been hung and skillfully butchered into proffessional cuts , clearly labled , neatly packaged and boxed. 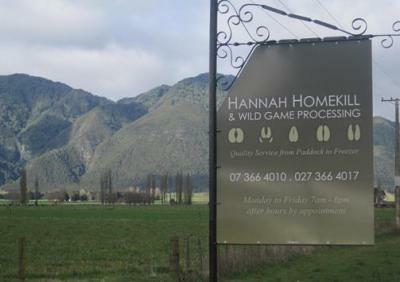 Hannah Homekill and Wild Game processing was started in Galatea in 2013 by Neville Hannah after gaining experience within New Zealand and overseas. With the commitment to providing a quality and proffessional homekill service from day one, our premises are built and maintaind to the highest standards, ensuring all meat is handled hygienicaly and efficiently at all times. We understand the time and attention that has gone into rearing an animal or hunting game and we aim to reflect that in the care we take in processing your meat.